Just a short post to let you know I'm still alive and kicking. Something strange in the neighborhood? Maybe. I've joined the VIPS team. (Vancouver and Interior Paranormal Society), and went out on an investigation on Friday at a hot spot in the Lower Mainland for activity. Don't know if it was paranormal or a major tech blow up, but I am down one digital recorder now. 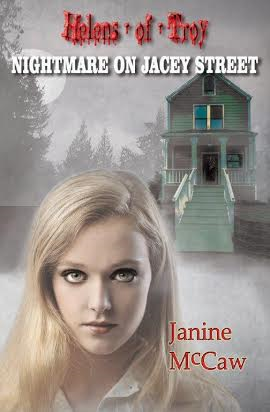 Then for some shameless self-promotion, HELENS-OF-TROY eBook is now .99 cents at most online retailers, although if you go to my website at www.janinemccaw.com and subscribe to my newsletter you might get a free coupon delivered to your mailbox. (wink). What's it about? "Demon nannies, vampire godsons, exorcising runaway husbands, berserker football players and ghost dads; the book has it all. "-Amazon review. And a heads-up that the sequel, NIGHTMARE ON JACEY STREET will be available for pre-order this July.